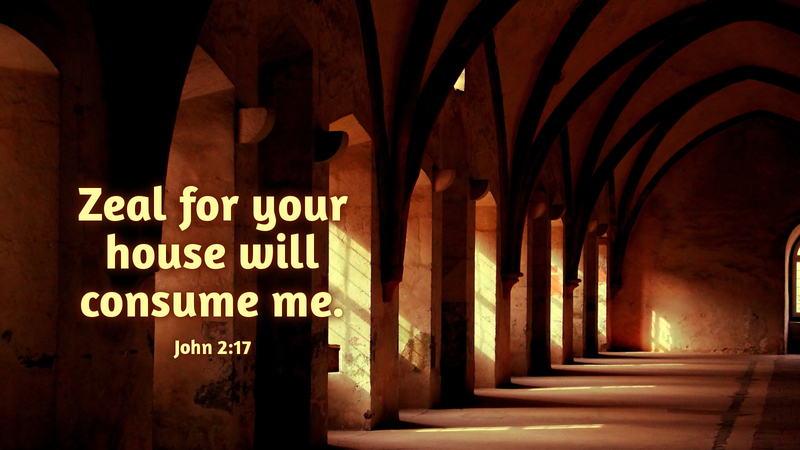 “Zeal for your house will consume me” (John 2:17). I remember as a child in Sunday School being given a list of Bible verses to memorize; they were listed from A to Z. This was the final verse on that list. Not only is it a statement from the lips of Jesus, it is a quotation from the Old Testament as well (Psalm 69:9). As a child, I didn’t know what the term “zeal” meant. I assumed “zealous” was probably an old fashioned way of saying “jealous” or something along those lines. But now I know that zeal is almost more the opposite. Jealousy wants to keep something to oneself; zeal is the kind of enthusiasm that can’t help but let itself go. It is a word often used to describe a passionate energy that flows out of a person’s heart in faith. To say that Jesus experienced “zeal” for God’s house on the day he drove the money-changers from the temple, was not to say he wanted something contained or held back. Rather, the faith Jesus exemplified for us was one that poured out of him, in an enthusiastic and passionate love for those around him, gathered in his Father’s house in prayer. Prayer: Lord, give us the same kind zeal in faith and prayer that you showed for us in Christ. Amen. Today’s devotion was written by Steven E. King, Pastor of Living Word Antioch Lutheran Church, Roseville, MN, and Managing Editor of Sola Publishing.